Mardi Gras season is here and the parades are about to roll! If you didn’t make it this year, put in on your calendar to reserve your spot early for the best show on earth. We’ll be watching the parades from our doorstep and balcony at the Grand Victorian and some of the best sights are of the parade floats themselves. Made locally here in New Orleans, you can take a behind the scenes tour at Mardi Gras World and view the artists at work making these beautiful floats year round. Here are photos Innkeeper Bonnie Rabe took on a recent visit to Mardi Gras World for a first hand look at what you’ll find at one of our top recommended, unique and naturally New Orleans local tours. Get your crocodile smile on at Mardi Gras World; we’ll be posting more from the floats along the route. Look forward to seeing you here soon! This entry was posted in Area Events, Festivals, New Orleans and tagged French Quarter Festival, Mardi Gras. Bookmark the permalink. You are thinking about that long-awaited journey to New Orleans, but can’t decide on when to come. Do you like crowds or quiet balconies? Parades or garden tours? Festivals or concert halls? Here are a few tips from the Grand Victorian staff to help you decide. Summer is hot and so are the special deals you can find to design that economical vacation or stay-cation to enjoy all that the city has to offer. COOLinary menus allow you to try 2 and 3 course lunches and dinners for low prices. The festivals continue with Creole Tomato, Cajun-Zydeco, Essence, Satchmo and weekly free summer music offerings in our incredible parks. The Grand Victorian also offers great summer rates for a cool respite after your sizzling summer days. You have to experience it at least one time in your life, and we can help you make it the experience you will enjoy. There are many ways to experience Mardi Gras – parades, costumes, family picnics and ribald entertainment from the masses. We do Mardi Gras family style in the Garden District, where our home is right on the parade route for over 50 parades during the two-week season. When you’re tired of the crowd, just jaunt over to the porch to enjoy the pageantry from afar. It is usually during February or March, check the calendar as the date changes every year. If you love the live local music like we do, then April is for you! 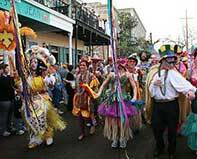 French Quarter Festival and Jazz Festival are the weekends we enjoy most in the city. An abundance of musical talent on 10 or more stages plus an over-abundance of restaurant food tasting choices can tempt even the most solitary traveler. Make the festival one of your own design by choosing which musical acts to enjoy or which food booth to park your chair near. 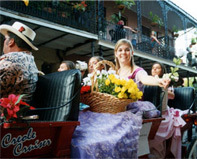 Great spring weather added onto these elements make spring the easy choice for your next New Orleans vacation. 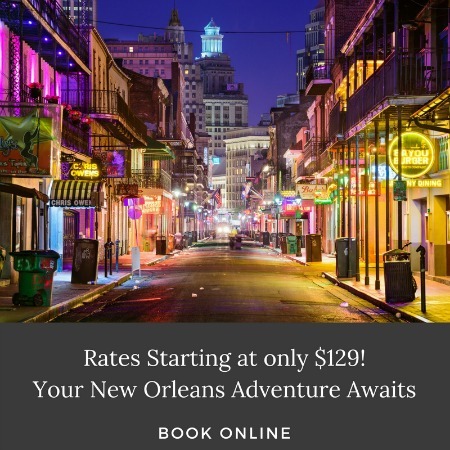 The Grand Victorian tends to book early for Mardi Gras and the spring festivals, but we always have good deals in the summertime! Make this historic New Orleans bed and breakfast your home away from home this year! This entry was posted in Area Events, Festivals, New Orleans, Travel Tips and tagged French Quarter Festival, Jazz & Heritage Festival, Jazz Fest, Satchmo Fest. Bookmark the permalink. Food, music, and good times is the anthem of New Orleans! The French Quarter Festivals Inc. is proud to host the 28th Annual French Quarter Festival throughout the streets of downtown New Orleans. Last year, the 2010 French Quarter Festival set unbelievable records bringing over 512,000 locals and out-of-towners to the Quarter. This year is no exception and the Quarter is getting ready for the hustle and bustle of one exciting weekend! Food vendors include some of New Orleans greatest cuisine ranging from Plum Street Snoballs to Superior Grill to The Court of Two Sisters. Whether it’s their first year participating in the Festival or they have been part of the fun since the beginning, the restaurants cannot wait to showcase their most popular dishes. There isn’t a better way to get a taste of the city than at the French Quarter Festival. If your mouth isn’t drooling by now, then checkout the musical line-up on the seventeen stages that span the Square. The music rings through the city ranging from jazz to foxtrot. Everyone looks forward to hearing the sounds that began at the heart of Louisiana. Grab your friends and family and bring them down to the ol’ Crescent City for the ultimate New Orleans experience. The fun begins on Thursday, April 7 and doesn’t end until the sunsets of Sunday April 10, 2011. This entry was posted in Festivals, French Quarter and tagged French Quarter Festival. Bookmark the permalink.